Celebrate your wedding or special event and thank your guests with a gift of a packet of seeds. These are popular and valued gifts. We provide customised seed packets, each printed with your special message, a colour photo of the flowers and sowing instructions for your guests. 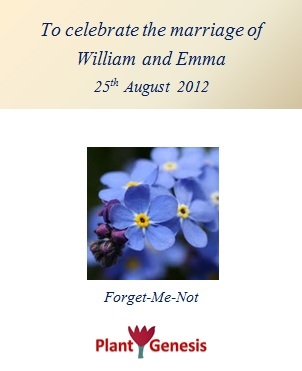 We include 50 seeds of Forget-Me-Not(Myosotis sylvatica) in each packet. The flowers of these plants are awell-known symbol of try love. They are easy to grow hardy biennial seeds thatcan be planted in directly in the ground. Seeds can be sown in spring toautumn, and are suitable as gifts all year round. Plants flower in the springto early summer of the year after sowing and grow to a height of 30-50cm. See how your Wedding Favours are packed. Please order a minimum of two weeks before your special event, but we can normally prepare your seeds sooner if needed - please contact us first and we will confirm what we can do for you.We deliver using first class Signed For mail with Royal Mail to ensure your parcel gets to you in time. Please contact us if you have any questions.